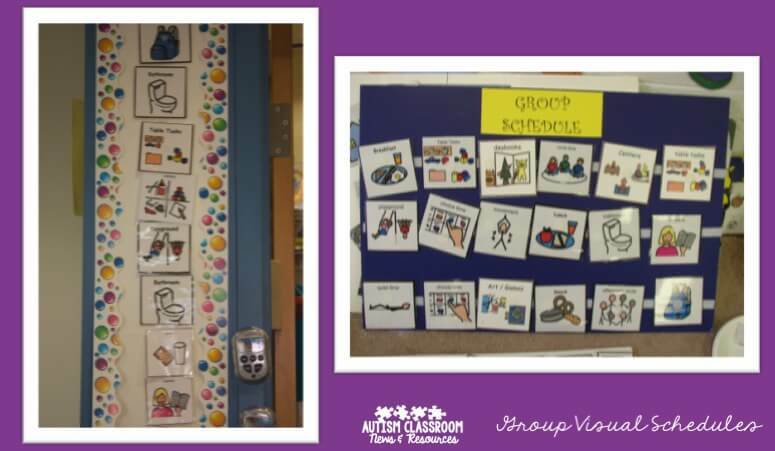 The importance of group schedules in special education classrooms are next up in our series on visual schedules. You can find the earlier posts here. Check for the next post at the end of this one. Group schedules are a way to demonstrate what the whole class is doing. They are frequently used as best practice in general education classrooms, particularly in the younger grades. Usually in general education classes they are written schedules. However, when you think about the fact that most kindergartners are just learning to read, pictures in these settings make sense. I find in self-contained environments, teachers tend to forget the importance of the use of a group schedule. I remember training with a colleague years ago that we pulled from the school to do training in another district. Her regular job was mentoring teachers in autism classrooms. As she was doing the training on visual supports, she suddenly stopped talking. I asked her later why and she said she had just realized that her teachers weren’t all using group schedules and she had forgotten how important they are to a classroom. Group schedules can take lots of forms. Typically they are either written or pictures of some type. Sometimes they are part of the morning meeting routine to review the schedule, sometimes they are at the door so they get checked at transitions, and sometimes they are done with times on them or like a clock. The key to construction is just matching it to the needs of the students. For instance, the clock schedule is going to be more difficult for a child just learning time and sequence to follow than the schedules that goes left-to-right or top-to-bottom. As I noted in a previous post, top-to-bottom organization is better for developmentally younger students. One of the questions people often ask about the use of group schedules is what to do with them when the students are doing individual activities, like centers. We solve that problem by making center schedules with more than 1 picture on them. The students’ individual schedules then tell them the order of the center activities. So, if you have been reading this series, you may be asking, “If all my students have individual schedules, why would I need a group schedule?” That is an excellent question! 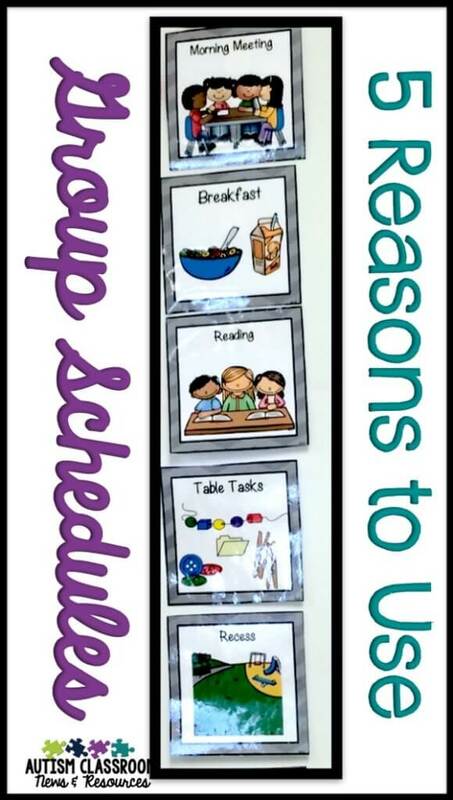 Here are the top 5 reasons why it is important to use group schedules! group schedules during morning meeting, to talk about the upcoming day, and then review them by turning finished activities’ visuals over and talking about what comes next. It provides a visual support for students to talk about their day. When we review the schedule at the end of the day or throughout the day, we review what we did. This is a great language building activity to work on talking about what they did today. It helps students learn time and sequence and embeds the review of the sequencing into the daily routine. You can also talk about what the whole class did and what the individual students did. It provides a reference for the staff and the students to know the overall scope of the day at a glance by looking at a central location for the schedule with larger visuals. Finding what is happening next on individual schedules is sometimes difficult to do from across the room because the visuals are smaller. A central group schedule with larger visuals is easier to reference for everyone throughout the day. Finally, and probably most importantly, it helps to build independence and provide a transitional support. Ultimately, we would love for all our students to be able to navigate their daily routine in the same manner as their age-appropriate typical peers. Typical peers have some type of daily group schedule that they follow. 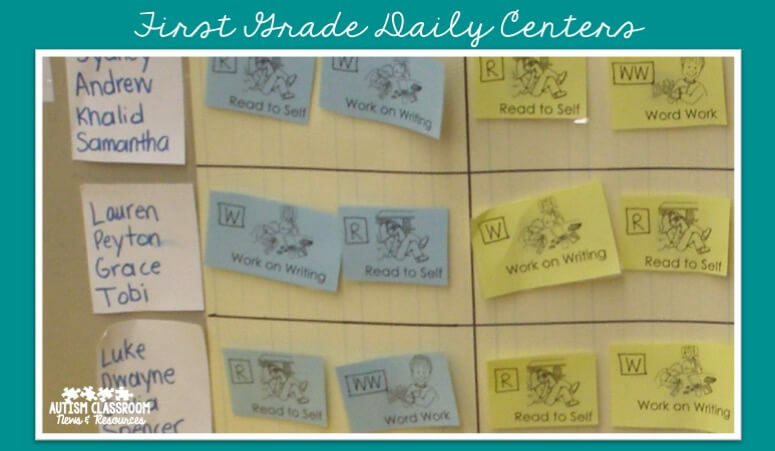 Their kindergarten or first-grade classroom may have a daily schedule that shows them their day with a center schedule for the Daily Five–like those below. A high school chemistry teacher might have a written list of tasks for the class to complete or review the schedule orally. 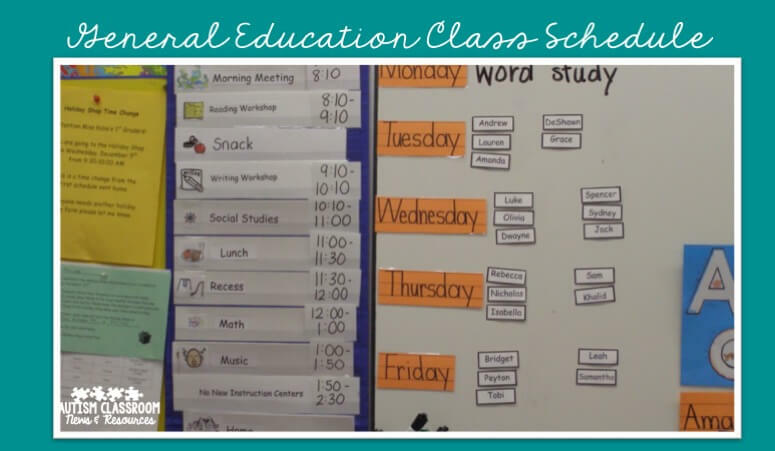 The use of a group schedule in a self-contained classroom helps students to reference the natural cue of a schedule in other classroom settings. Eventually it may be possible to fade a student using a full-day schedule to following the group schedule with just a center schedule for the activities that are done individually. Having the group schedule provides a scaffolding to be able to build these skills and move more toward the natural environment. So that gives you a taste of the way individual schedules can be used and the variety. In the next post I will show you some mini schedules for routines. 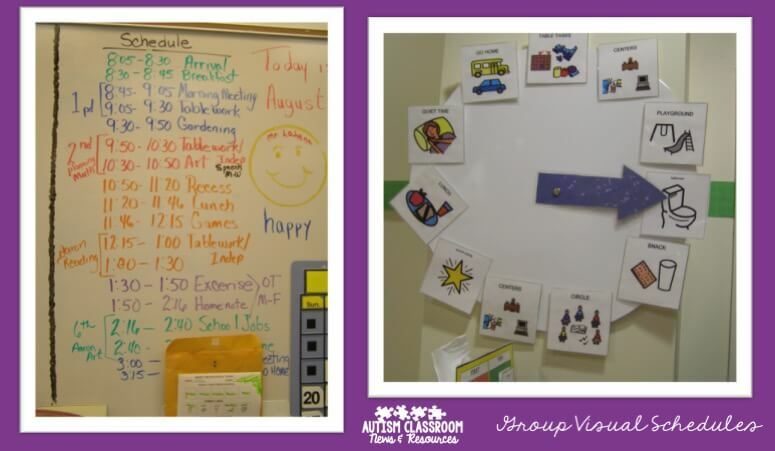 In the meantime, check out my visual schedule bundles for all ages on TPT if you are interested the schedules that you have seen in some of the pictures. The books linked below are also useful to get started with visual schedules. I am loving this series. I used a group schedule on our classroom door (which was almost always open). I mainly used it for when visitors came they would know what we were doing or if we were not in the room. I wrote the times next to each labeled picture similar to the group schedule for kindergarten. I think I will post a schedule outside the classroom and in a more central location in the classroom for the students to see. Great post!! Thanks for sharing that idea Lacey! I have taught in an integrated preschool room for seven years. The group schedule is excellent in the beginning of the year for establishing the routine and security for my typical peers. It is excellent to be able to show a child who is having separation exactly what they will have to do before they go home. And later in the year, I can make short work of "Are we doing… today?" (usually going outside) by saying, "look at the schedule." 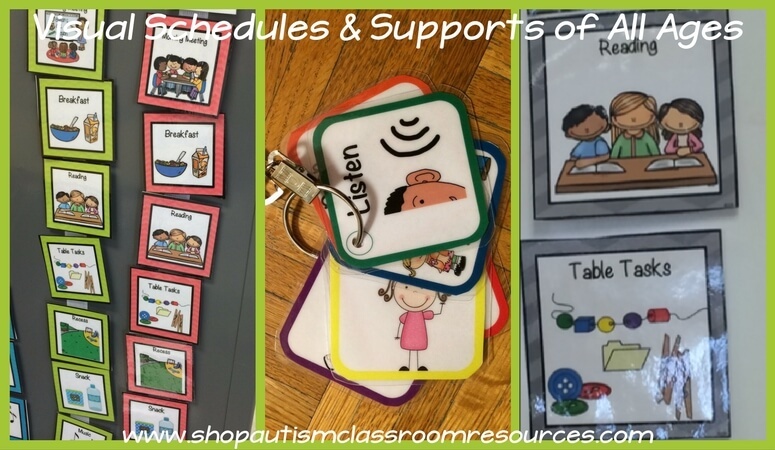 I have used the group schedule as you said for m special needs kids by having them use the group schedule (it is in a povket chart and I have them take down the cards) and then having a small within task schedule of sorts for them to use at centers. Thank you for sharing your experience! That's a great example! Yes, one of the great things about schedules is it does get rid of the "What's next?" questions!